All these tools from DDP Beauty set are made from Japanese J2 stainless steel, but they all are coated with cheetah print coat. Hair cutting scissors have razor edge blades which are extremely sharp, ensuring smooth and accurate cutting, hair thinning shears have razor edge and micro-teeth blades which provide sleek and precise thinning without pulling or tearing the hair, but thinning razor has razor edge blade which, as one might guess, is razor-sharp. All of these tools – cutting scissors, thinning shears, thinning razor – are 5.5 inches long which is considered to be perfect length for hairdressing. The total weight of this DDP Beauty set is 1.6 ounces. It is important, that hair cutting and thinning shears have possibility to adjust the tension of shears, therefore, every hairdresser can tighten or loosen its scissors for desired tension. Another useful feature of these shears is removable finger rest for better work ergonomics which can be removed if it is interfering. They also have removable finger inserts which help to adjust the size of finger holes for necessary size. 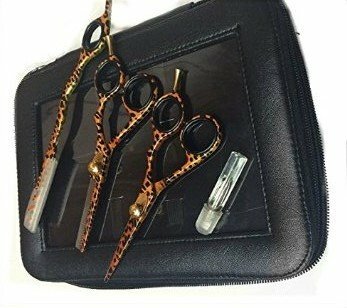 This DDP Beauty set includes one piece of hair cutting scissors, one piece of hair thinning shears, one piece of thinning razor, black synthetic leather storage case with zipper, as well as lubricant for tension screws. Considering that these hair scissors are made from stainless steel, their blades are silver color with metallic sheen, but they are slightly visible, because surface of shears is coated with cheetah print coat which adds unique and stylish appearance. Elegance is ensured by golden color tension adjustment screws on cutting and thinning scissors. Another element of design is glittery finger rings. As this DDP Beauty set includes both cutting and thinning tools, they can be used both for hair cutting and hair thinning. This set is great both for professional hairdressers and hairdressing students, because it includes all of necessary tools for affordable price. Tools of this DDP Beauty set are made from Japanese J2 stainless steel and all of them have razor edge blades. All of these tools are 5.5 inches long and the total weight of this set is 1.6 ounces. Their design can be characterized by polished silver blades, cheetah print coat, golden color tension adjustment screws and finger rests, as well as glittery finger rings. Other features of these DDP Beauty shears are tension adjustment screws, finger rests and removable finger inserts. This set includes such products as cutting scissors, thinning shears, thinning razor, synthetic leather storage case and lubricant. These tools are suitable both for professional and amateurish use.